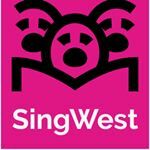 SingWest Community Choir are a group of locals who get together once a week to sing a mix of contemporary, folk, and choral music, under our extremely talented music director. You don't need to read music to join, and you don't even need to be especially good at singing! It’s not about a perfect musical performance, but about an uplifting, life-affirming antidote to the stress and routine of everyday life - followed by a trip to the pub! We rehearse every Monday evening during term time from 7:30 pm for about an hour and a half in St Peter’s Church. For more details, visit the SINGWEST website, or FOLLOW US on Instagram.